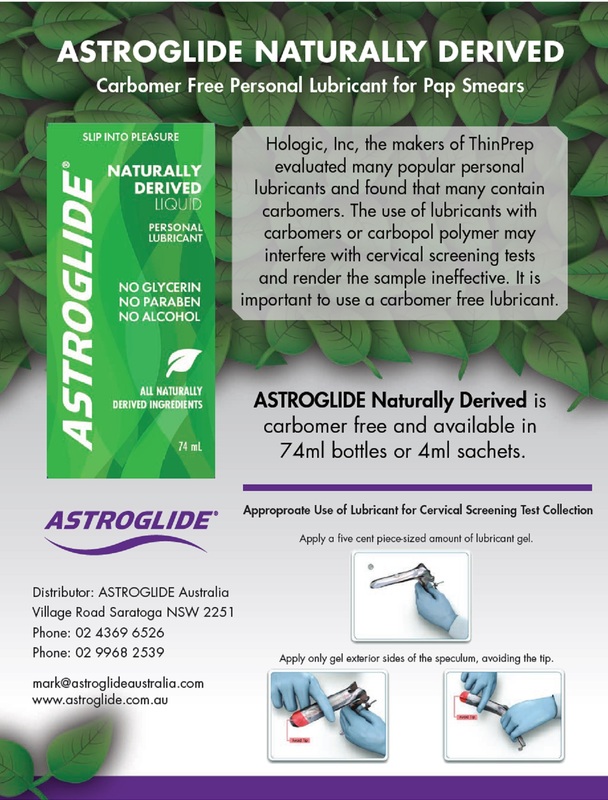 Astroglide Naturally Derived Personal Lubricant has been approved by Hologic ®, the manufacturers of the ThinPrep® Pap Smear Cervical Screening Test Kits. Astroglide Naturally Derived is free of carbomers and carbopol polymers, which are prone to interfere with cervical screening tests. Therefore when applied correctly, using Astroglide Personal Lubricant will not interfere with Pap Smear Cervical Screening Test Samples. See below for speculum application instructions. It is available in 4ml sachets or 74ml bottles and Doctors, Clinics, Hospitals and Medical Centres can contact Astroglide Australia for further details and wholesale pricing. Astroglide's water based personal lubricants are also recommended for Colonoscopy and Gastroscopy procedures as they do not fog the camera. It is available in 4ml sachets, 74ml bottles and 148ml bottles and Doctors, Clinics, Hospitals and Medical Centres can contact Astroglide for further details and wholesale pricing.